Fight slavery? There’s an app for that. If you’ve got a smart phone, iPod, or iPad, you also have access to tools that can equip you to fight human trafficking through education, through shopping, and through sharing. Search human trafficking and you’ll see the Trafficking In Persons app. This is a handy guide/ self-education course on the U.S. Trafficking In Persons report and human trafficking. It is a great app to recommend to anyone wanting to learn more about human trafficking in the U.S. and around the world. Free2Work: Wondering how a company or product rates regarding their involvement in slave labor? 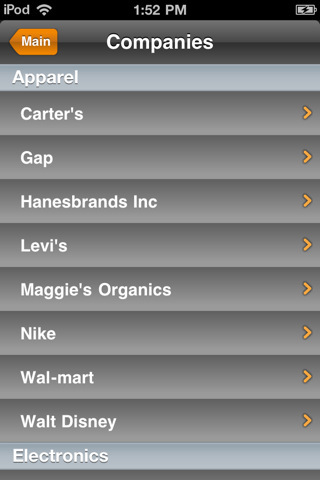 Free2work.com now has an app with grades for common products/ companies. Phone users can scan barcode on products as they are shopping to see the score on that product. You may also access tweets from premier abolitionist, like David Batstone. Call and Response: This abolitionist movement/ rockumentary has an app with videos, tweets, campaigns, and other information to help equip abolitionists in the fight. Use it to contact companies and ask them to be slavery free through their Blood Phone, Slave Free, and Chain Store Reaction campaigns. International Justice Mission: IJM is an international humans rights agency that secures freedom and others right for victims of slavery and other forms of exploitation. Get news and video from their work, read blogs from Gary Haugen and others, see a map where their work is being done, send encouraging notes to those on the ground, and learn how to get involved. R-Day: November 11, 2011 has been declared Redemption Day, a time to come together for the freedom for those who are oppressed. Learn more on the R Day app. There are also some exciting apps coming soon designed to help people from becoming victims or to help those already victimized. NetHope.org. in partnership with other organizations offered a “Stop Human Trafficking App Design Challenge.” The two winning designers were recently announced. The Grand Prize winner created the “Working Abroad” app. Designed to assist those seeking to work in other countries, the app includes information to warn users about signs that they are being lured into the human trafficking. Posted in Educational Messages, Get Involved, News, Uncategorized and tagged as apps, Call and Response, free2work, human trafficking, labor trafficking, slavery, smartphone, TIP.